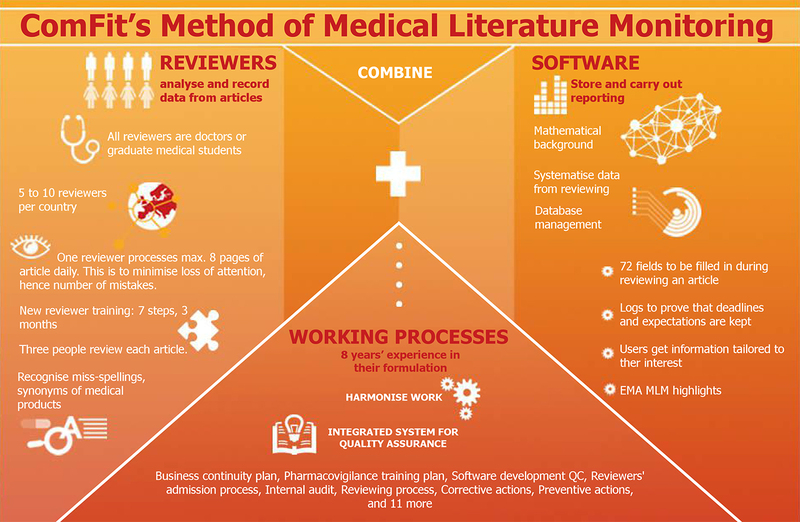 PHARMACOVIGILANCE LITERATURE MONITORING - ComFit Europe Ltd. The guarantee of our accuracy is in our ISO:9001 certified, integrated method. We use standardised working procedures across countries and combine the work by PV trained medical professionals with our validated software: medical professionals review while software report and store data. We employ reviewers with excellent medical knowledge and reading skills who analyse articles according to 72 aspects and record the data in the ComFit database uniquely designed for that purpose. The engine of the database performs the reporting according to the users’ personal interests. The software can easily find matches of thousands of active ingredients recorded in article data sheets and combine various aspects of users’ needs. The human factor is inevitable at gaining the data, while the machine is unbeatable in punctuality and combination of aspects of reporting. We process ALL medical journals of the countries in which our service is available. No exception. In international databases, only a part of the national journals can be found. We have all of them. We subscribe to the journals, do not rely on libraries.